Today I bring you something fresh from the oven, this disaster of a Hebrew tattoo was just inked last week! Oh, but whatever does it say? The guy meant his Hebrew tattoo to say "Greater Things", but he probably got his translation from either an online translator or his worst enemy. This actually says "Her Rabi Had Given" or maybe "She-Rabi Nathan". You can kind of see how it got there. The first word has to do with magnitude, even if not in the way the victim meant, while the second word means "given", and you can give things... 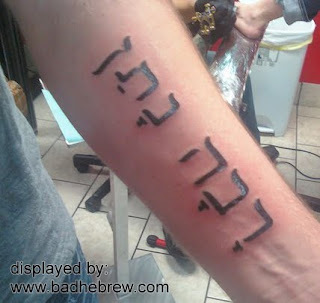 But really, this Hebrew tattoo is a big, silly mess. Do I really need to repeat the warning again? I guess I do. Never use an online translator when translating an expression from English to Hebrew. You might correctly translate a single word, but never an expression. It's nearly impossible to get right! The best way to thank your buddy for something you are em.. really(!!) thankfull for is of course tatooing "thank you" on your arm. This is obviously the case here, it says "thank you nathan" or "Toda raba Nathan", but we just can't see the word "Toda"
A wrong-direction 'Wild Nate'? I often wonder what victims do when they learn they've been victimized. In this case, a trash can is handy in the background, large enough for at least the arm, cut up into pieces. Or if he's more desparate: The liner bag does say "This bag is not a hat", but he can always claim not to be big on *any* language. Oy. Poor guy. Long-sleeved shirts for you, buddy. And here I thought the guy was a Breslov chassid...Raba Natan was the talmid of Rebbe Nachman of Breslev. "dvarin gdolim yoter" is more like.. "bigger stuff". I'd hate to think anyone would get that in hebrew & think it's a good tattoo to have. & I don't know why you write the same thing over & over it's not like people read this blog & THEN go to a translator to get their tattoo. anyway I think they should stick a "yud" in there & have the tatt say: "riba natan.." ("given jam").. cos hey who doesn't love jam? I think that דברים גדולים יותר is too cumbersome as a phrase and as a tattoo. Actually in this case, Google Translate gives a very interesting suggestion: דברים רבתי (just like Greater London is לונדון רבתי). This tattoo is really bad, by the way. It looks as if someone shoved the person's hand into a giant, nasty typing machine. actually, without the dagesh in the bet it turns into a V. unless i'm forgetting anything, i don't think that's even a word. This Hebrew Tattoo example shows the folly of someone who doesn't really know Hebrew trying to translate a complicated thought or concept ("greater things") into a nice short pithy Hebrew phrase for a tattoo. There are lots of ways it *could* be translated, but the "correct" one needs a thorough understanding of what you mean, of Modern Hebrew culture, etc. Why bother? I know this guy. He has no idea!